Periodicamente l’Osservatorio AIR pubblica premi, bandi, concorsi e call for paper su temi specifici della better regulation. Per sottoporre proposte di ricerca e paper inediti relativi ad argomenti diversi da quelli delle call in corso, vai alla pagina Submit papers. Abstracts should be at least 150 words long, but longer and more fully-developed abstracts up to 500 words are welcome and encouraged where possible. Abstracts should be sent (in .doc or .docx format) to info@osservatorioair.it by 15th December 2014. All proposals will undergo peer review and notifications of acceptance will be sent out by 20th January 2015. 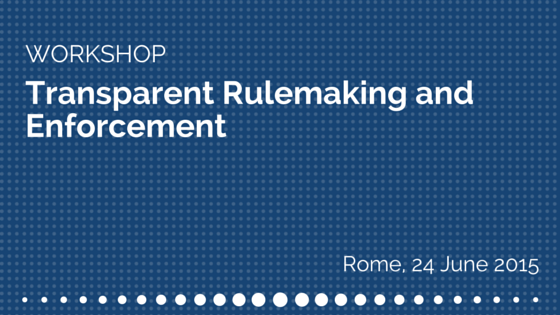 Successful applicants will be invited to present a first draft version of their paper during a Workshop that will be held in Rome in June 2015. The Observatory will cover travel and lodging expenses for up to four successful candidates (for a total amount of 500 € per person). Full papers are expected to be delivered by 15th September 2015 for publication on the Observatory website, getting an ISSN (International Standard Serial Number) number for the “I papers dell’Osservatorio” series. They must be no longer than 8,000 words (footnotes included) and must be sent (in .doc or .docx format) to info@osservatorioair.it. Luca Di Donato, Regulatory Impact Assessment (RIA) and behavioural research: a new perspective?